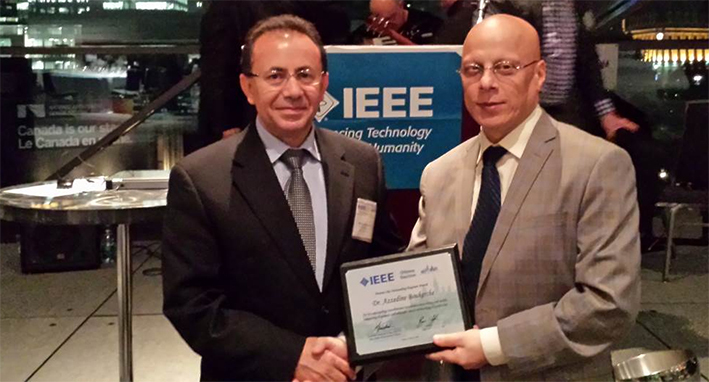 Professor A. Boukerche was selected to receive the prestigious IEEE Ottawa Section Outstanding Engineer Award for 2014. The presentation took place at the 70th Annual General Meeting Banquet on Friday, October 10, 2014 at the Ottawa Convention Centre. The Keynote Speaker was Mr. Luc Brule, Vice-President of the Canadian Space Agency (CSA). The Awards and Recognition Committee chose Professor Boukerche "for his outstanding research contributions to wireless networking and mobile computing in general and vehicular sensor networking in particular". Dr. Azzedine Boukerche is a Professor and Canada Research Chair in Large-Scale Distributed Interactive Simulations and Mobile Computing and Networking. He is also the Director of PARADISE Research Laboratory at the School of Electrical Engineering and Computer Science, University of Ottawa, and the Scientific Director and founding of the DIVA (nsercdiva.com) Strategic Research Network, the first ever hosted at the University of Ottawa. Dr. Azzedine Boukerche is a distinguished scholar among his peers and is a recipient of several international awards. He is working towards the design of the next generation of Intelligent Transportation Systems and Vehicular Sensor Networks which will change our way of living in the near future. Claude Lague, the Dean of Faculty engineering, said “Toutes mes félicitations, Azzedine”.